The P1 took to the streets of Vienna on June 26, 1898, making it one of the first vehicles registered in Austria. Porsche's first design included a compact electric drive weighing 286 pounds and offering an output of 3 hp, or up to 5 hp in overloading mode, allowing it to reach up to 22 mph. When driven in this manner, speed was regulated via a 12-speed controller. The overall range could span up to 50 miles. Under the electric system was coachbuilder Lohner's alternating vehicle body, which allowed the vehicle to be used all year. The first practical test of the "P1" came in September 1899 at the international motor vehicle exhibition in Berlin. A race for electric vehicles over a distance of 24 miles was announced for September 28, and Ferdinand Porsche steered his "P1" across the finish line 18 minutes ahead of the next competitor with three passengers on board. He also came out on top in the efficiency test, as his "P1" recorded the lowest energy consumption in urban traffic while more than half the participants failed to reach the finish line due to technical difficulties. 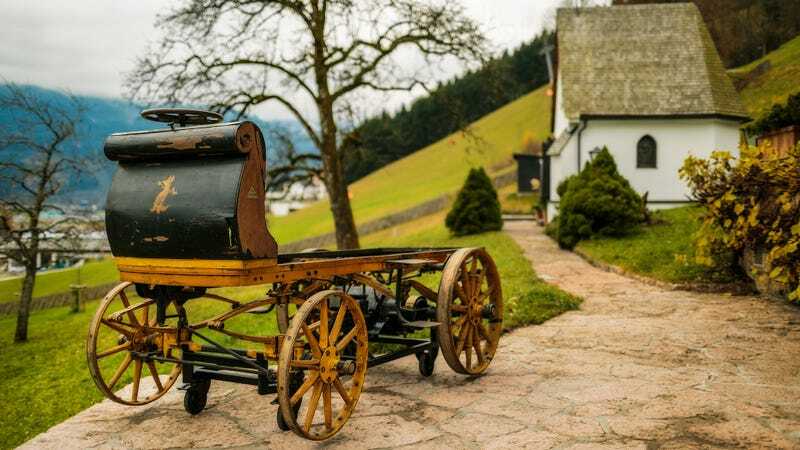 What followed this success was the production version known as the Lohner-Porsche, while this prototype has only been recovered now after 114 years in original and unrestored form. If you happen to be around Stuttgart on February 1 and 2, you can check out the P1 free of charge as part of the celebrations to mark the fifth anniversary of the Porsche Museum. It always worth a visit.